Introduction. 2. Depositional environments and lithologic associations. 3. The world ocean. 4. Oceans: the regions underlain by oceanic crust. 5. Continental margins. 6. Orogenic belts. 7. Ophiolite association. 8. Melanges, suture zones, blueschist metamorphic belts and serpentinite filled faults. 9. Zoned mafic/ultramafic complexes in phanerozoic orogenic belts (Alaska or Ural type). 10. Unimodal mafic volcanic-sedimentary association. 11. Unimodal felsic volcanic- sedimentary association. 12. Bimodal volcanic-sedimentary association. 13. Andesite-dominated, marine to continental volcanic-sedimentary association. 14. Basalt, andesite, rhyolite sequentially-differentiated marine to continental volcanic-sedimentary association. 15. Pelagic sediments. 16. Deeper marine, sandstone-shale association: flysch facies. 17. Deeper marine argillite (slate, schist)-lesser chert, carbonate, arenite association ("black" sediments emphasis). 18. Continental platforms. 19. Shallow-marine detrital sedimentary association of orogenic belts and platforms. 20. Shallow-marine carbonates. 21. Marine evaporites. 22. Petroleum, natural gas, solid bitumens. 23. Weathering, soil profiles, karst. 24. Recent continental sedimentary environments and cainozoic unconsolidated continental sediments. 25. Pre-quaternary continental sedimentary association. 26. Continental, pre-quaternary, calc-alkaline volcanic and subvolcanic association. 27. Intracrustal and subcrustal environments. 28. Plutonic granite, diorite, (gabbro) association and its aureole. 29. High- to medium-grade metamorphosed terrains, katazonal granites, pegmatites. 30. Continental fragmentation, rifts, paleo-rifts. 31. Continental plateau basalt and bimodal volcanic association. 32. Diabase, gabbro and similar dikes and sills. 33. Alkaline igneous association. References. Indexes. This is the most comprehensive, all-embracing, single source of data on metallic deposits and their worldwide distribution. With over 1,750 pages it contains: 594 figures illustrating ore styles and their setting; 113 tables providing concise but highly quantitative data on several thousand locality examples; 4 indexes (general, locality, genetic, metals) enabling rapid and thorough searches; and more than 2,000 references. 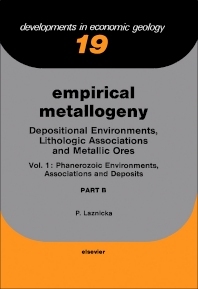 This vast body of information on metallic ore deposits is arranged by environments in which they presently form or lithologic associations in which they occur. The organization of the book follows the approach employed in regional mineral-potential evaluation and exploration. Long-lasting, objectively observable host units and empirical indicators of ore presence are stressed. The coverage is balanced and truly worldwide, based on original literature consulted in over 30 languages and on the author's personal familiarity with more than 2,000 ore deposits located in 85 countries. The book is a must for practising exploration geologists, petrologists, and economic geologists, as well as for specialists in various other branches of geology (e.g. glacial geologists, carbonate sedimentologists, volcanologists, and geochemists). Teachers and students will find this most complete data sourcebook an ideal supplement to the theory and basic data found in textbooks.